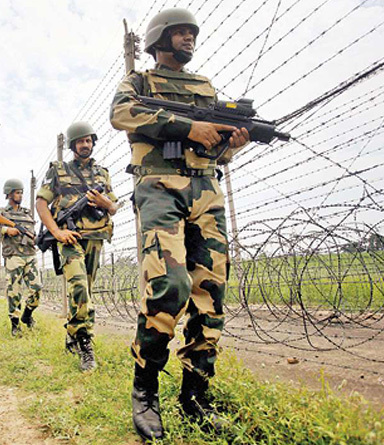 The Border Security Force (BSF) is the primary border guarding force of India. It was raised in the wake of the 1965 War on 1 December 1965, "for ensuring the security of the borders of India and for matters connected there with". It is a Central Armed Police Force charged with guarding India's land border during peacetime and preventing transnational crime. It is a Union Government Agency under the administrative control of Ministry of Home Affairs. The BSF has grown exponentially from a few battalions in 1965, to 186 battalions with a sanctioned strength of 257,363 personnel including an expanding air wing, marine wing, artillery regiments, and commando units. It currently stands as the world's largest border guarding force. 19 to 25 yrs Degree from a recognized University/Institution or equivalent, possession of NCC B or C certificate, or outstanding achievements in sports or athletics will be an added qualification. 18 to 23 years Matric or equivalent plus two years ITI certificate in Radio and TV/ Electronics or Intermediate or 10+2 or equivalent with Physics, Chemistry and Mathematics from a recognized Board of Education.